The definition of multiplication as repeated addition provides a way to arrive at a set-theoretic interpretation of multiplication of cardinal numbers. A more accurate representation is to think of it as scaling quantities. This animation illustrates 3 being multiplied by 2, giving 6 as a result. Notice that the blue dot in the blue segment of length 3 is placed at position 1, and the blue segment is scaled so that this dot is placed at the end of the red segment, of length 2. For multiplication by any X, the blue dot will always start at 1 and end at X. This works even for X smaller than 1, or negative. 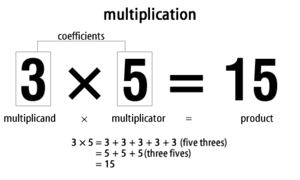 Teachers usually require their pupils to memorize the table of the first 9 numbers when teaching multiplication. This page was last changed on 17 February 2018, at 18:50.